How was Washington Planning to Prevail in Afghanistan, Anyhow? Just the other day, US National Security Adviser John Bolton told Reuters that Russia got itself “stuck” in Syria. At the same time, this prominent Western war hawk deliberately omitted the fact that Russia’s armed forces entered into the Syrian conflict only in September 2015, fulfilling the invitation issued by the legitimate Syrian government mired in fighting the most powerful terrorist group in existence, the so-called “Islamic State in Iraq and Syria” (ISIS). Moreover, in a matter of month Russian pilots managed to inflict extensive damage to both the supply lines of ISIS and to its largest strongholds. Somehow, John Bolton couldn’t be bothered with acknowledging that on the other hand, the US really has gotten itself stuck in Afghanistan, almost two decades ago and has made zero progress in bringing peace since. Back in 2016, then US president-elect Donald Trump promised to downscale American military deployments across the world, thus turning away from the protracted crises that Washington itself created and has been unable to resolve. However, even today, thousands of American servicemen are fighting a bitter war in Afghanistan. Moreover, there‘s an ever increasing military buildup by the Pentagon in Afghanistan that is being reported by local observers. It’s noteworthy that Washington has been wasting more than 40 billion dollars on the Afghan war a year for a total of sixteen years. In recent years, the US Senate has been increasingly frustrated with the absence of anything even remotely resembling success amid the American operation in Afghanistan, with a number of senators voicing their belief that the Pentagon has been deliberately hiding facts about the actual state of affairs from the general public. All this shows that that Trump’s new approach to Afghanistan, suspiciously familiar to Washington’s old approach, has clearly failed. 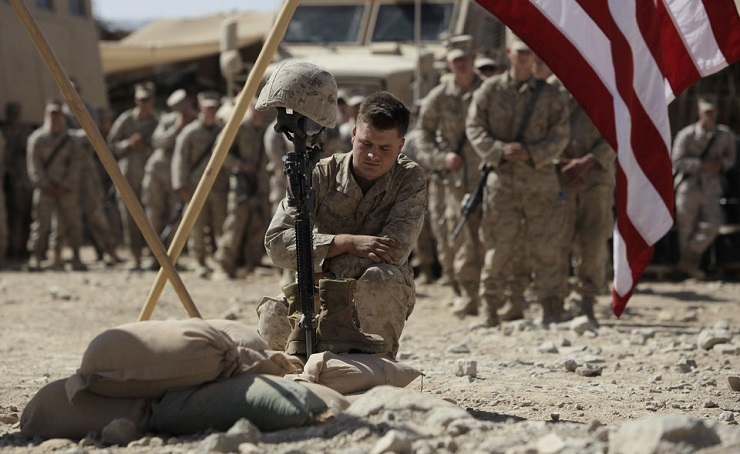 In one of his interviews, former US Secretary of Defense Charles Hagel announced that after 17 years in Afghanistan, the situation is worse than it’s ever been, adding that he believes that the American people and Congress are about to start asking some pretty good questions. According to the former official, the American military can’t fix such problems as poppy production, corruption, tribal decisions, and topography. Hagel has gone as far as to confide to the media that at some point there’s been well over 100,000 troops deployed simultaneously in Afghanistan, but it had no effect on the actual situation on the ground, which means that Washington must eventually start packing at some moment in time. According to a number of experts from across the region, American authorities are hard at work preparing the construction of a number military bases across the northern provinces of Afghanistan, which will be just an initial stage of additional military deployment of American servicemen. According to the info revealed by the Afghan media, additional military bases will accommodate new ground units of the US armed forces numbering from 200 to 1,000 men. However, as the actual number of formidable military installations being erected in the mountains remain a secret, one can safely expect at least two new bases becopming operational in the provinces of Baghlan and Faryab. It is stated that the main purpose behind the increase of American troops deployed in Afghanistan will be the protection of strategically important highways constructed in the regions of active mineral extraction. Many American military units are being redeployed from Iraq to Afghanistan, with many of them from the US Air Force. And this concentration of air power is becoming particularly noticeable these days. In Kandahar, the Pentagon has managed to accumulate the largest task force of MQ-9 Reaper drones in modern history. The total number of them hasn’t been revealed, but reports state that there’s at least three squadrons stationed there, which brings the total number up to at least 15 drones. After a three year absence, A-10 Warthog ground assault planes are returning to Afghanistan, together with HH-60G PaveHawk helicopters, and Brazilian-made A-29 Super Tucano light attack planes. Additionally, air refueling units are being redeployed to Afghanistan from the Persian Gulf, together with RC-135 RivetJoint reconnaissance aircraft and E-8 Joint Surveillance Target Attack Radar System (Joint STARS). Unsurprisingly, there’s an ever increasing number of F-18, F-16 and B-52s being seen in Afghan skies. These days, American generals are attaching much of their hope for a positive change in the situation on the ground with the arrival of the first of the six Security Force Assistance Brigades (SFAB). It’s been noted that over the past 16 years, Special Operations have become the new American way of war. Once mainly used to supplement the work of conventional troops, these elite units are now the go-to option for Western policymakers. However, any form of oversight of those troops is limited by the fact that the general public remains largely unaware of the sometimes-classified missions. Most importantly, it’s unclear how these deployments fit together in a broader plan to advance US national security. So it’s only logical that Special Operations forces now make up nearly all US combat casualties, despite making up less than 5% of the total force. Under these circumstances, it’s nearly impossible to explain how in spite of the ever increasing number of all sorts of US military units deployed in Afghanistan, the Taliban carries on its expansion across the country. As it has been recently revealed by NBC, Trump has been vocally expressing his discontent with the absence of any noticeable improvements in the situation on the ground in Afghanistan, which forced him into contemplating a plan put forward by Erik Prince, founder of the private military company Academi, formerly known as Blackwater. The latter pushes for Washington to hand over responsibility for all Western operations across Afghanistan to private military companies. However, the US national security council opposes this initiative bitterly, out of fear that Trump can pull the plug on the US military deployment unexpectedly, which can affect the personal fortune of a lot of high-profile representatives of US military circles that have established a profitable network of corruption across Afghanistan that allows them to reap billions of dollars in development aid and deployment expenses. Last year, USA Today reported with a special reference to Erik Prince that Washington was prepared to transfer most of its responsibilities in Afghanistan to private contractors. It was assumed that up to 5,500 contractors, the better part of which are former special unit officers, would be providing training to the Afghan military, thus replacing the Pentagon’s role in this training. Prince noted that a private air fleet of 90 aircraft could be sent to the country and that this course of action may allow Washington to save up to 10 billion dollars a year, which is much lower than the budget the Pentagon received this year, and goes far beyond the 40 billion dollars mark. The US has been waging war on Afghanistan for more than 16 years, wasting more than a trillion dollars in the process. In 2011, the number of US servicemen in Afghanistan reached 100,000 men, only to be scaled down to 8,500 soldiers deployed back when Donald Trump took office. As of now, there’s well over 14 thousand American soldiers operating in this Central Asian state. But it is still remains unclear how this task force will be capable of attaining the goals that a force that was at least seven times bigger couldn’t. However, the deeper the US gets stuck in Afghanistan, the more transparent its actual goal for this country becomes. It is a goal that had nothing in common with fighting terrorism and drug trafficking, quite the opposite. From day one Washington was trying to plunge Afghanistan into a state of perpetual chaos, while creating a huge opportunity for the Pentagon to steal billions of taxpayer money, with US generals and CIA operatives becoming astoundingly rich due to the booming drug production levels.